In a project designed to reinvigorate the city’s regional arts and cultural hub, systems integration firm The P.A. People recently upgraded the audio system at Sydney’s Rockdale Town Hall. The new state-of-the-art system features HARMAN’s JBL VRX Constant Curvature loudspeakers and a Soundcraft Si Expression 1 digital console. 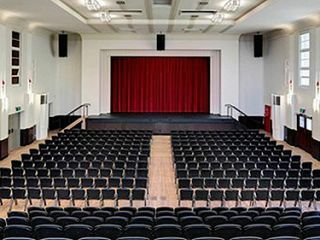 The new audio components at Rockdale Town Hall provide fresh life to the historic complex and provided Sydney with a world-class venue that can accommodate a varied array of events from musical concerts and variety shows to business, community and social events. In addition to the new PA and communications system, the auditorium’s beautiful Art Deco detailing has been restored. To avoid intruding on the classical aesthetics of the venue, an unobtrusive yet powerful PA system was required and Brett Steele, project manager for The P.A. People, immediately thought of the JBL VRX Constant Curvature loudspeakers. Hung in a left/center/right configuration, the VRX932LA loudspeakers deliver extraordinary power handling, clarity, flexibility and stunning JBL sound in an attractive, easy to handle, and affordable package. The PA is controlled through a Soundcraft Si Expression 1 digital mixing console, which is ideal for a venue that has to accommodate a wide variety of uses. HARMAN designs, manufactures and markets premier audio, visual, infotainment and integrated control solutions for the automotive, consumer and professional markets. With 15 leading brands, including AKG, Harman Kardon, Infinity, JBL, Lexicon, and Mark Levinson, the Company is admired by audiophiles, musicians and the entertainment venues where they perform. More than 25 million automobiles on the road today are equipped with HARMAN audio and infotainment systems. HARMAN has a global workforce of 15,200 people and reported sales of $5.1 billion for the last 12 months ended March 31, 2014.